Stylehawk Event Services are experienced event management professionals serving San Diego County, Orange County, LA County, and the Inland Empire. They specialize in not only maximizing venue revenues, but also matching clients to the perfect event venue. Cameron Ungar, and the staff at Stylehawk are event planning, logistical and operational experts. 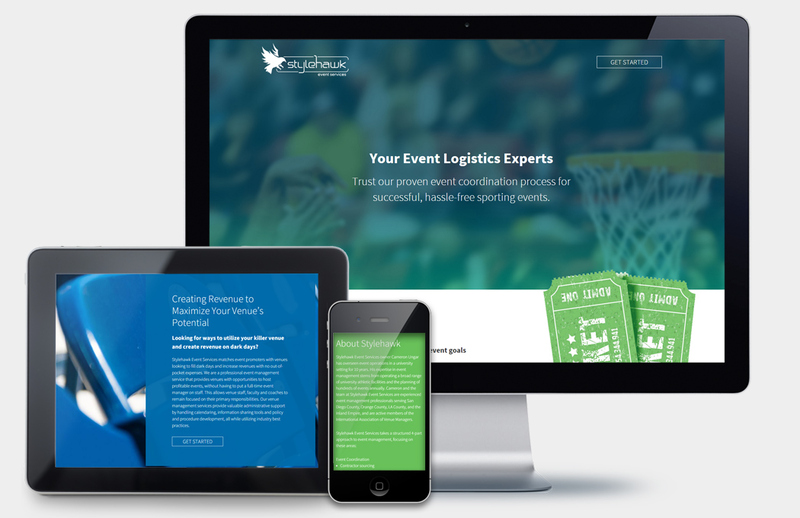 Stylehawk was looking to rework their current website, which was outdated and in need of a stylistic facelift to better attract customers looking for event management specialists. They also needed to better convey the level of expertise and professionalism the company represents and convert website visitors into qualified leads. We delivered a colorful and energetic, mobile responsive site built on the WordPress platform, keeping the same immersive imagery and ultra-clean look that made the original microsite a success. The new site allows Stylehawk to display their impressive database of Southern California sports event venues. The database-driven model also allows the company to not only add event venues through a simple CMS interface but makes the event venues searchable on the front-end based on type, location, and many other critical attributes, allowing event planners to find the perfect venue to achieve their goals.